voice lessons | and sure stars shining . . .
Twenty years ago today, my then-seniors in high school sang a senior recital. I found the program in my father’s belongings. Of these students, I visited with Matt Wilson in Chicago two or three years ago, and Jimmy Boswell is a Facebook friend. The rest have disappeared. These students were an especially good group, and I adored teaching them. This entry was posted in Daily Life, Getting older, Gigs and tagged 1998, senior recital, voice lessons, voice students on May 26, 2018 by Jeffrey Carter. This month marks 30 years of professional music-teaching and music-making. Following a successful run as Uncle Max in The Sound of Music at Blue Springs City Theatre in December 1987, several people asked me for voice lessons. I was working at the time for a McDonald’s franchise owner, in public relations. The first one to ask about instruction was Janon Cairns, the costumer for the theatre. Her 7th-grade son, Brad, was interested in theatre, and she wanted him to have lessons. The first lesson occurred in January 1988. But somehow, I was good at it, or at least people thought so, and more people wanted lessons. Later that year, when it was time to leave the food-service world, I ‘hung out a shingle’ that effectively said “Jeffrey Carter, voice teacher,” and soon enough had sufficient private students to make a living. Not long after, I bought the Kawai grand piano. And not long after that, the local community college called, looking for someone new to lead the Jacomo Chorale and teach music appreciation. And it all started in earnest 30 years this month. As I am yet again at the annual meeting of the Missouri Music Educators Association, I’m reminded of a blog entry from several years ago. These sentiments are still true and honest. Yesterday I visited with colleagues of many years, children of former teachers, professors who taught me nearly 30 years ago, former students, Webster alumni, and dear friends from today and yesterday. 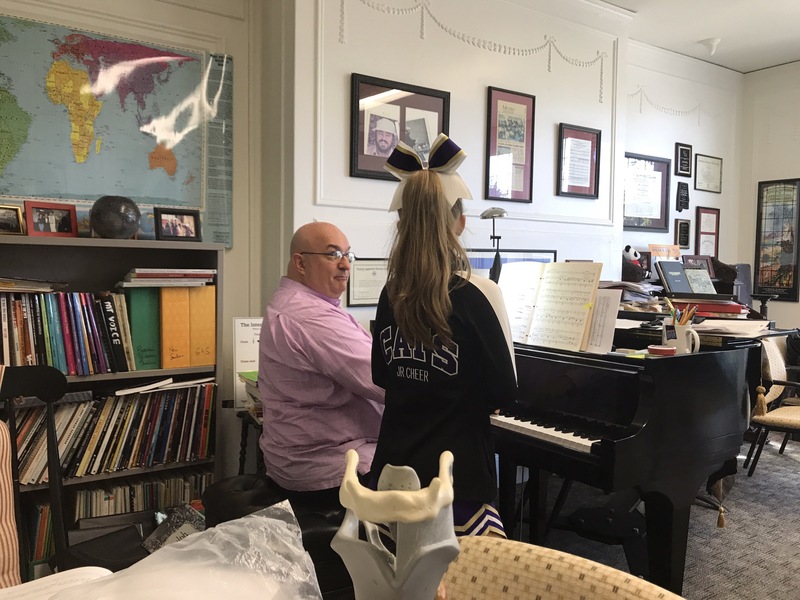 This entry was posted in Choral Music, Daily Life, Getting older, Life, Musical Theatre, Song and tagged MMEA, voice lessons, voice students on January 26, 2018 by Jeffrey Carter. My youngest student is Greta. Sixth grade. Junior cheer and all. This entry was posted in Daily Life and tagged voice lessons, voice students on September 18, 2017 by Jeffrey Carter.